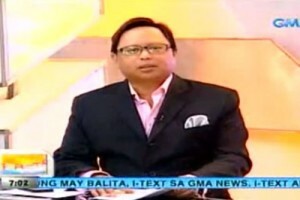 Arnold Clavio conducts a surprise interview with Kris Aquino impersonator Kris Tetay. 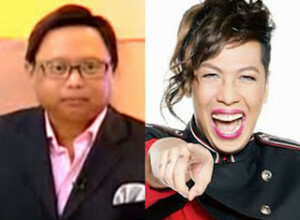 Arnold seemed to be surprised with who he’ll interview in his evening program episode of Tonight with Arnold Clavio in NewsTV channel 11. At first a familiar female voice was heard at the background. Clavio seemed to be guessing who she is until she came forward the stage and it was Kris Tetay impersonating the queen of all media Kris Aquino. The interview was a hilarious and a funny one as they talked about Krissy’s health first. She also mentioned about Noynoy’s life and how they are after his term as President. Tetay would joked about how he encouraged Noy to make tinapa and sell kakanin just to consume his spare time. She even shared her experience in peddling taho which she revealed how hard it is. Arnold asked Tetay about her short lived romance with Mayor Herbert Bautista. She was a bit surprised but talked about him anyway. Krissy was seen crying and laughing at the same time during the interview. She did very well!